Today, in 1767, Beal Ijams, who is my paternal 4th great grandfather, is born in Anne Arundel Co., MD. to John (1725-1781/7?) and Ariana (Worthington) Iiams (1729-1781). After the death of his father  but other records indicate 1787? he moved to Iredell Co., N.C. with some of his brothers and his half-sister who had married Capt. Basil Gaither. He built a log house in the area of North Carolina where he had settled. He owned land and also had slaves. According to Harry Wright Newman, after the settlement of Carolina the orthography of the name changes from 'Iiames' to 'Ijames' and in the early court records it is written simply as 'Jams'. In 1836, Davie County was organized out of the northern portion of Rowan county and the plantation of Beal Ijames fell into the newly created county. At the 1850 census for Davie county, Beal Ijames was aged 85 years, born in Maryland, with the following dwelling in his household: Matilda Ijames, aged 54; Denton Ijames, Constable, aged 37. He is my 2nd Cousin, 5 times removed. IJAMS, JOHN (November 18, 1725 - 1789). Son of George and Elizabeth Ijams. Married Ariana Worthington (widow of Nicholas Watkins) in 1758 and had six children: Vachel Ijams, Brice Ijams, Ariana Ijams Hendren, Beale Ijams, Denton Ijams, and Nicholas W. Ijams. John too the Oath of Allegiance in 1778 and subsequently moved to Prince George's County. 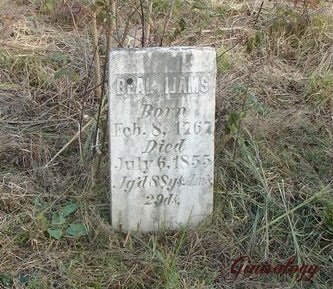 Russ ~ John Iiams is my 5th great grandfather...I am working on catching up on my notes and information received from family member and researcher Roberta...and...somehow, I missed the anniversary of his death date which is the 7th of Feb. 178?...research to do!